A website to share my experiences on child care and useful products for kids. Our existing pram for tweety was proving to be too big to be taken along while traveling. 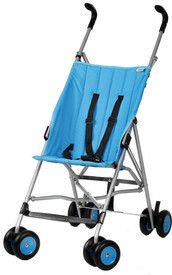 Also tweety can sit up now and thus we needed a lightweight stroller which could be as compact as possible when folded. Searched around on the internet a bit and found that the one compact form of stroller is the umbrella fold strollers. These are one's which can fold from central line running across their length and thus the name umbrella fold. Baby product websites have quite a few strollers but mostly they do not show a picture of the folded stroller or the kind of fold it has. Thus a common sign to tell if a stroller is umbrella fold is if the top handles are not joined. The search started online with babyoye, firstcry and flipkart all pitching in with a few options. The budget was not to go over 4000/- and the options within that range were from brands like Mee Mee, Fab n Funky and Little Wanderers. My favorite till now was Mee Mee stroller (MM-8369) for its color combinations and the fact that Mee Mee seems like a well established Indian brand. We went to a shopping mall to see the stroller physically before buying and were surprised to see that the Mee Mee stroller seemed to be of a lower quality as compared to even unknown brands available in the mall. Now in umbrella fold there are two options, cheaper one is where the sitting space is made of just a fabric fastened around two side bars like in the pictures above. This type is the lightest and cheapest. 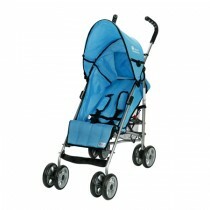 A similar strollers for good brands can be had for around Rs. 2000/- to Rs. 2500/-. However we feel that these are not very good for baby's posture as the fabric slacks a lot and the overall stroller is too light to be stable. Thus we needed something a bit heftier with a seat that is more than just thin fabric. Most of the strollers available are Chinese made and seem to be similar in features and construction irrespective of the brand.Thus it is better to look for the best deal (with an assurance of warranty in case of a defect). We got a few options like Little wanderer's (8401 Black Umbrella Stroller) and some Chicco strollers (too expensive to consider). The little wanderer's one though nice, seems to be too small to use after baby's first birthday. Thus dropped it and saw another stroller from a brand called Panda. This was a stroller almost exact replica of the Mee Mee stroller that we had liked, the only issue being dull color (Dark Brown). Also this was available for Rs. 2700/- and thus seemed like a tempting option. To check out all options before buying, we went into the Mee Mee store to take a look at our chosen one. 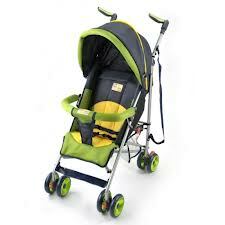 Although we found our color but the overall feel and quality of Mee Mee stroller seemed highly doubtful. Even the handles seemed a bit shaky. Color combinations were the only plus points. Thus there was no point in paying 1300/- more for an inferior stroller. We went and bought the Panda one. One issue with both the strollers was that the front bumper bar did not come off and thus Tweety was happily chewing at the bar while we strolled with her new ride. In fact tweety tasted every stroller that we tried that day. Finally the mission to get the stroller was over (or so we believed). We were now onto mumma's shopping and were about to get into a store when I saw a shiny green stroller in Lilliput store. Our brand new stroller felt like a cheap knock off in front of it. We couldn't stop ourselves from going in to ask the price. I really hoped they would say something astronomical so that i would still feel we got a good value for money stroller. But Alas, for price they said Rs. 3600/- after discount. It shattered my enthusiasm. All the hard work and we missed a great stroller within our budget just a few shops across. The stroller here had a nice sturdy feel to it. Even the bumper bar was detachable and the tyres seemed of good quality unlike ours which had slight wobble while moving. Also the front tyres could come off with a press of a button for compact storage. I wanted that stroller so bad that I tried my luck and went back to the store and asked if it could be returned. Now in India you can't return any thing you may have bought unlike western countries and as expected the shop keeper said that you can get store credit or buy something for same amount. I was so floored by the stroller that I agreed. Thus we went about buying stuff which we believe was inevitable in near future. We bought a wooden toy tweety, gifts for upcoming birthdays, tweety's milk bottle and a steel thermos to carry hot water for tweety while traveling. The MRP for this was close to Rs. 5000/- but it was available on 30% discount and considering the quality and finish this is a bargain when compared to higher priced Mee-Mee strollers. We did our stroller shopping from GIP mall in Noida. What's the model number/name for this lilliput stroller? Does the back offer flat/stiff support ? Do the wheels have suspension/spring - I find the walkway in parks quite jarring for a little one. Yes, the back offers flat/stiff support and rather than having 2 or 3 fixed reclining position, you can adjust recline to whatever is most comfortable for the child. It does not have suspension in wheels, however based on my search, suspensions in wheels is effective only for very high end prams. For others it is just a stiff spring added above wheels to give the impression of shock absorbers. Also there was no model number as such. As Lilliput probably does not manufacture these, and simply sells for the sake of having everything in their stores, you may need to check with your nearest store.